1 Week cancellation notice is required for group bookings. 1 nights stay will be charged for cancellations less than a weeks notice. A/C is provided at an additional cost of Rs.750 per day/ per room. 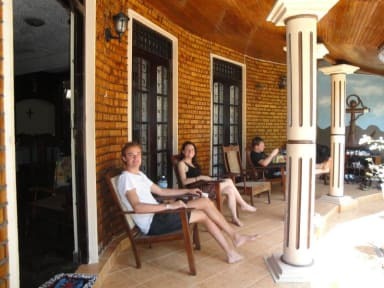 Located on the south side of Colombo, the Lavinia Beach Hostel is only a 2 minute walk to the beautiful Mount Lavinia beach where the golden sand is lined with pubs and restaurants. Walking in the other direction to the main road you‘ll find supermarkets, take-away outlets, clothing stores and even tailoring shops. The Lavinia Beach Hostel offer complimentary, make-your-own coffee and tea and laundry/ironing facilities. Free Wi-Fi available 24hrs. Airport transfers are available on request at reasonable rates. Lovely, clean and very hospitable. Good location, close to the train, the beach and the main road. Would recommend to anyone to stay here! 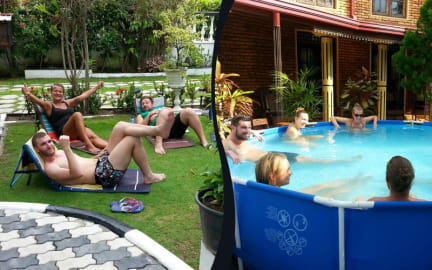 This hostel gave us a very home-like feeling! It excist out of 3 houses who all have rooms and kitchen and a livingroom available. The swimming pool was very clean and a nice refreshment! Also very friendly and helpfull staf! Loved our stay here. Defenitly recommend it! Very kind hearted people and a very good price! Would recommend IT for sure! I got here during off season, so it was pretty empty. Great hostel though, everything was clean-ish. Have experienced cleaner hostels. The people who work there are the kindest though, and breakfast was real good. Doesn't have much extra facilities, but you know what to expect if you read before you book. Overall, I would recommend it!